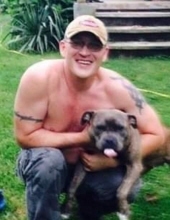 Kevin Johnson, age 41, of Bevinsville, KY, died Thursday, November 15, 2018, in Michigan. He was born in Pikeville, KY on December 24, 1976 to Ray Johnson and Opalene Hall Johnson. Funeral services for Kevin Johnson will be held at the Little Rock Regular Baptist Church at Bevinsville, KY Wednesday, November 21, 2018 at 12:00PM with Old Reg. Bapt. Ministers officiating. Burial will follow at the Scott Burke Cemetery at Bevinsville, KY. Visitation will be held at the Church Tuesday after 3:00PM. with Old Regular Baptist Ministers officiating. "Email Address" would like to share the life celebration of Kevin Johnson. Click on the "link" to go to share a favorite memory or leave a condolence message for the family.